TAHLEQUAH, Okla. – Cherokee Nation Principal Chief Bill John Baker and Attorney General Todd Hembree met with President Barack Obama to discuss a matter before the United States Supreme Court that could mean more than $50 million to the Cherokee Nation. “The president was very respectful of our request, took notes and promised to further investigate the issue,” Chief Baker said. Chief Baker, Hembree and some 18 tribal leaders from across the United States met with President Obama at the Mandarin Oriental Hotel in Washington, D.C., for an hour Wednesday. Chief Baker was the only leader to present the president with a gift, which he seemingly appreciated. “We gave the president a native-designed business card holder, and he held it the entire meeting. The cardholder had business cards from Todd and me, and the president put them in his pocket and thanked us again for the gift on his way out. I believe the Cherokee Nation had a good day of government-to-government relations,” Chief Baker continued. Chief Baker was the second leader to address the group. He spoke about contract support costs. The federal government previously contracted with tribes to provide direct medical, educational and other services the government is obligated to provide but the tribes were not fully compensated for. In June 2012, the Supreme Court held the U.S. government liable for underpaying contracts that the Bureau of Indian Affairs has been awarding Indian Tribes since 1994 (Salazar v. Ramah Navajo Chapter). The Supreme Court also applied this ruling to cases involving contract underpayments by Indian Health Services (Arctic Slope Native Association v. Sebelius). Chief Baker was also the only tribal leader to present the president with a white paper. The document detailed the Cherokee Nation’s concern about being reimbursed for the services provided. Near the end of the meeting, a light moment was enjoyed between the president and Attorney General Hembree. As the final speaker, Hembree noted to the president that no Indian has ever been appointed to the Supreme Court. The president immediately quipped that he can’t appoint Hembree because, “I just met you, man.” The room erupted in laughter and Hembree was applauded. "I appreciated the president's humor, but even more so the seriousness with which he considered our request. This could mean tens of millions of dollars in reimbursement to the Nation and an immeasurable impact on the Cherokee people. 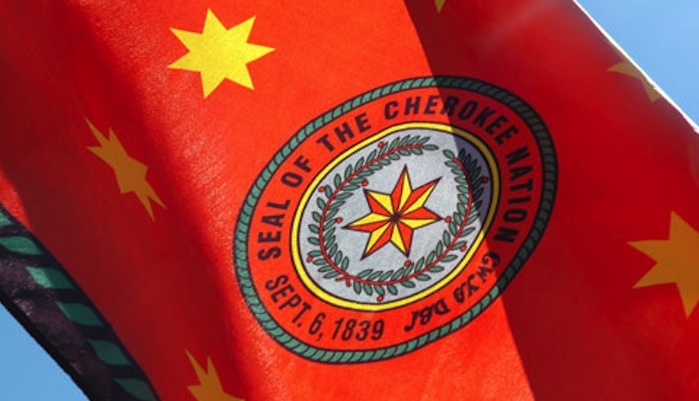 The Cherokee Nation was well represented today," Hembree said. Responses to "Cherokee leaders meet with President Obama"
Can you trust the goverment, look what happen the last time. I have been told scene is was a little baby I was Cherokee. I have my family tree but I can not find where my family came from some say my grand father changed his last name, but I just don't know. Does anyone know how to prove what tribe you are from? I am so proud to be native I just wish I knew how much native I am. I want my children to know who they are so they can be proud of where they came from. Thank you so much for reading this any information would be helpful. The meeting was at the Mandarin Oriental Hotel? At a hotel? Why cannot the representatives of sovereign nations meet the President at the White House? OSIYO I DO NOT TRUST THE GOVERNMENT OR OBAMA. HE HAS TOLD TO MANY WHITE EYES TO THE NATIVE PEOPLE AND BE BEING A MEMBER FO THE EASTERN BAND OF THE CHEROKEE TRIBE AND OF THE WOLF CLAN I DO NOT BELIEVE ANYTHING THAT HE SAYS. MORE WHITE EYES LIES. still trusting of this government? Although I support and respect Obama, he is not one of us and cannot understand the pride and feelings that go with us. I would have been happier if he had met under our conditions instead of his own. White House? No, not there either...too many lies have been said under that roof.